Surge Your Profits: Internet & Social Marketing Strategies: Do I Need a Google+ CUSTOM URL? Really? Do I Need a Google+ CUSTOM URL? Really? Matching Tea Set! Twitter tea-pot, Facebook saucers , Google+ tea-cups, Pinterest plates? Grandma would 'love' this! I mean would you think of serving a sumptuous afternoon tea (high tea) complete with chef's signature patisserie with a hotch-potch tea-set of a myriad design pieces? They would ruin the look and taste of your tea party even if chef's patisseries were 5-star michelin, culinary masterpieces! The (visual) delivery (how it is served to your customers) is as important as the (hidden) execution (how it was prepared). So too when you serve your social media links to your audience: the consistency of your social URLs affects the appearance and branding of your business. The more matching they are the less confusion and diffusion there will be of your BRAND. And shorter, pretty URLs make you more memorable for a longer period - you literally stamp your mark onto their hippocampus (the seat of memory in the human brain) eg. - And is better and easier for BRANDING purposes. - Your brand is more cohesive when social URLs are CONSISTENT across different platforms. - Easier to build trust because your custom link looks less formidable than the original. - Custom URLs are permanent! Don't customise if your website/name is going to be short term. - Unless you use .com your Google custom URL will end with your TLD such as .net, .info, etc. If in doubt don't customise...yet, but if the whole world is trending that way you may not have much choice but to confront that issue again in the future. In the meantime you could risk losing that valuable Google+ custom URL to your competition or other parties. Don't kick yourself later when it's gone! As an extreme measure you can always delete your page later if you change your mind. IMO it is wiser to get your Google+ CUSTOM URL for your PAGE sooner rather than later, if you have already claimed your other social URLs. This way you have a matching 'Tea-Set' of social URLs for both aesthetic and functional purposes when it comes to your online social presence, SEO and branding! Note that custom URLs are NOT 'standard'. Even when you get your custom URL there may be slight differences or variations eg. /+PerthPatisserie versus /+Perthpatisserie or even /+perthpatisserie. I prefer the former version (capped first letters) because it accomodates visual recognition better (although it would not make any difference to application text-readers). You will find out what version you get when your custom URL is offered to you. Hopefully it matches your expectations because you CANNOT edit it in any way at this point in time (unlike Facebook's custom URLs although conditions do apply). You can however ensure your Google+ page has the name you desire most (which is editable but within their TOS) and hope that the URL Google offers you will match the version you have displayed! A small detail perhaps, but it may be important to some? Tip: if you're going to comment, add your custom url too? High visibility is good for branding, sharing, traffic and SEO generally. And all this for ... free! 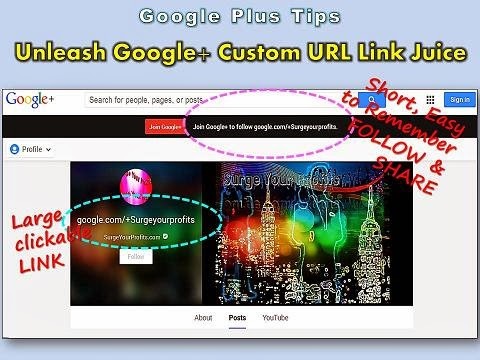 Even if you are a household name make it easy for your fans to find you because your Google+ URL is not that obvious especially to those who are new to Google+ or if you do not post often. And if you're not a household name yet then this strategic move using Google+ custom URL will help you in the right direction. So if you've got it, flaunt it and in the process, help your audience find you more easily even as G+ membership surges ahead year on year! BTW there's another bonus in using your Google+ custom URL. Your Youtube videos located on your Google+ YouTube TAB gets a truncated link eg. /+Surgeyourprofits/videos which you can now share easily (pssst...take your fans to your Google+ and Youtube page with just one click). Remember to upload your videos first (only the nine latest videos will be displayed on Google+). Now Meet Grandma @ Grandma's Tea Party - Isn't She Lovely?? Enjoy!! 1. We reserve the right to reclaim custom URLs or remove them for any reason, and without notice.